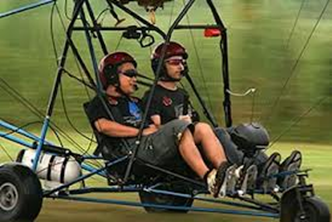 The reasons why people may want to start flying an ultralight plane, have been the same since the industry started many years ago. Low Cost, Simplicity, Freedom and adventure. For over 20 years, you could teach in just about anything that you could make fly with two people on board. However, with the withdrawal of the ultralight training exemption, and the implementation of the sport pilot regulations, the picture changed. There is no fixed flight training requirement for a new pilot wanting to fly a Part 103 ultralight in the US. Experience has shown that the average person takes 7 -15 hours of dual training to get ready for solo. The minimum FAA approved to pilot a two-place Quicksilver aircraft is a Sport Pilot License. This rating requires a minimum of 15 hours of dual training and 5 hours of supervised solo training. Everyone is different and the actual amount of training time varies widely. Sometimes a person needs to overcome individual challenges but with proper training most people are capable of learning to fly. This opens a great business opportunity for anybody that wants to open a business, which involves flying. Training Schools. With the recent release of Quicksilver’s SLSA ultralight, the Sport 2S, Quicksilver has enabled you to offer training in the industries #1 aircraft.